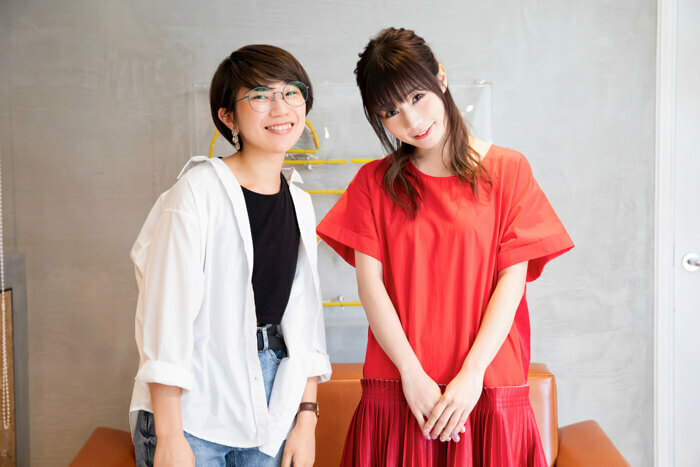 Sai Sai Jaran Jaran is a featured series here on MOSHI MOSHI NIPPON from the members of the all-female band SILEN SIREN (aka Sai Sai) who visit various hot spots in Japan and experience different things, the Sai Sai way. This month we’ll be following band bassist Ainyan, who is also responsible for having designed the band’s original character Sai Sai-kun and even handling the designs of the band’s official merchandise. Ainyan loves writing with calligraphy pens. 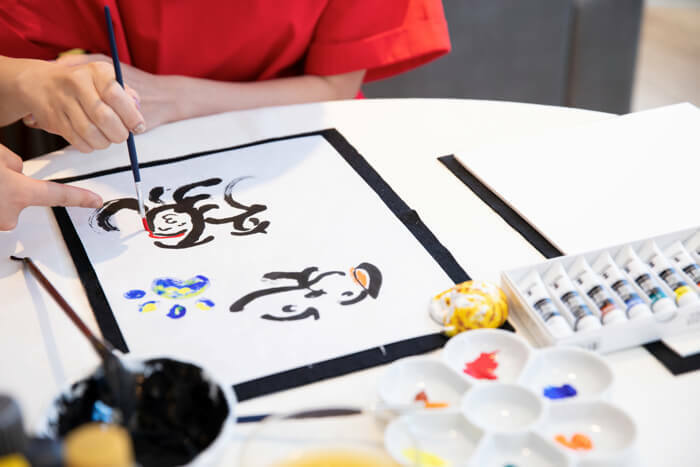 She also knows about and is interested in artistic calligraphy posted online. 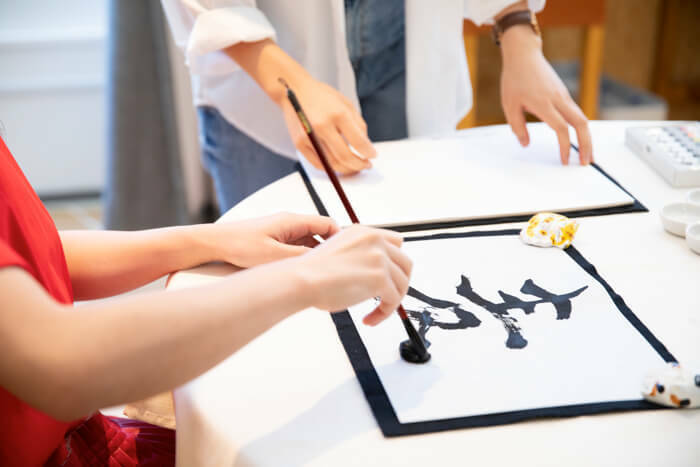 Teaching her calligraphy art today is calligrapher Yuki who showcases her work at events, and her skills have also been requested for projects. 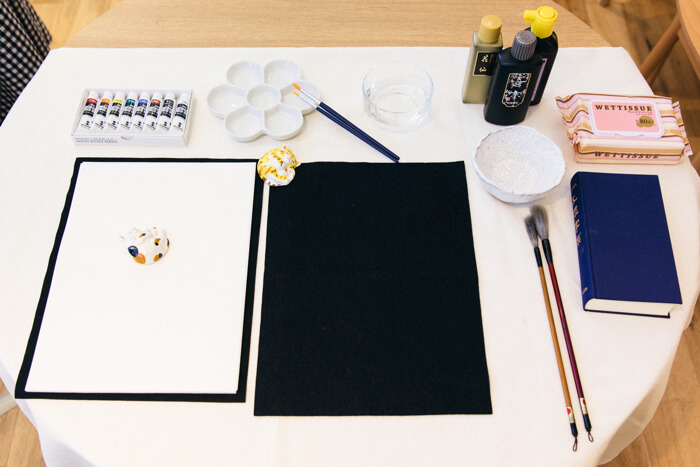 All that you need to produce calligraphy art is an ordinary Japanese calligraphy set. As well as a brush, ink, shijajiki mat and paper weight you’ll need watercolour equipment and coloured autograph card. The first step is to think of the character you want to write. If you can’t think of one you can flick through a Japanese dictionary. 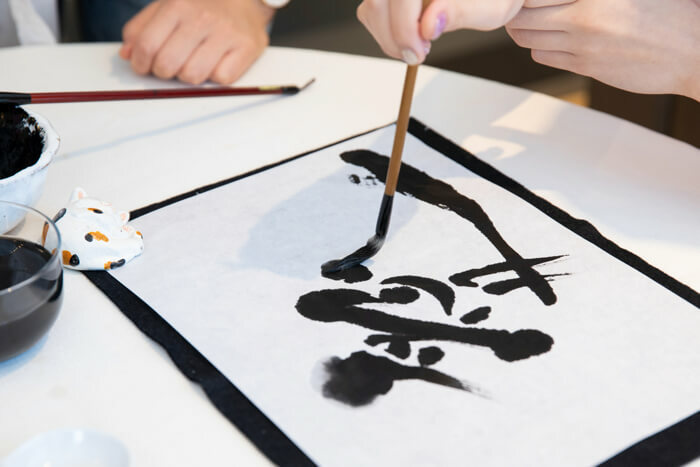 The thing to note about calligraphy art is that you’re free to write as you like! 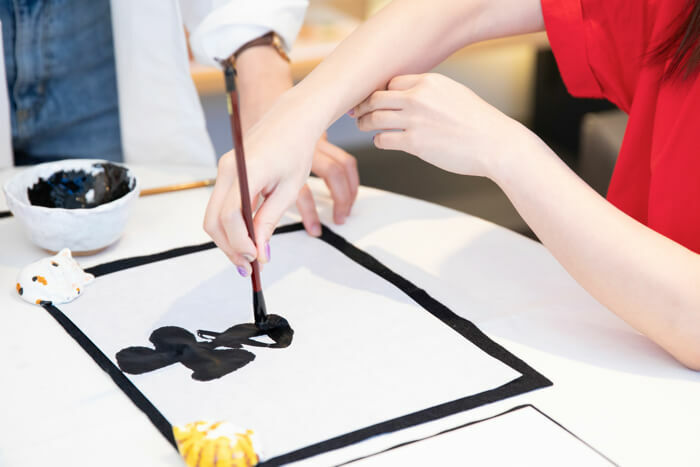 There’s no strict rules like in regular Japanese calligraphy. 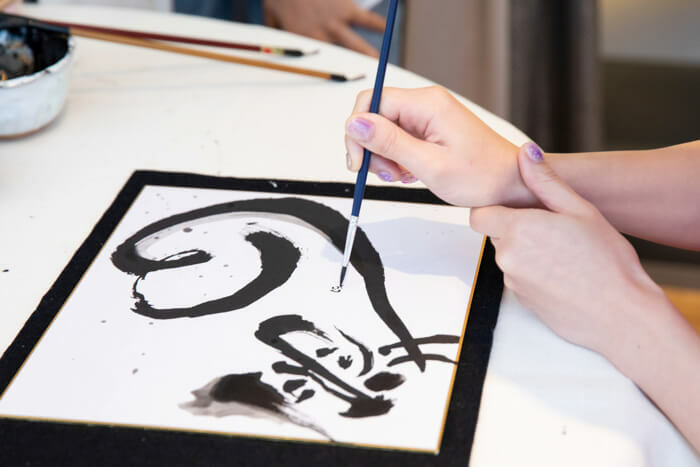 For example, you can hold the brush in any way you like, write in whatever style you like, and go over any lines you’ve already put on the paper. 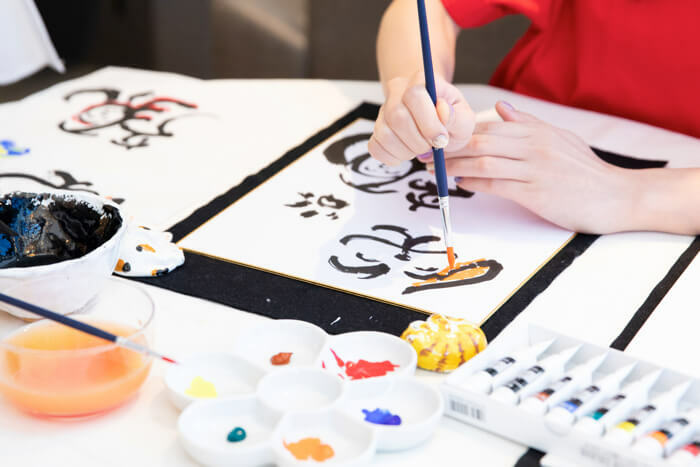 It’s important to think freely and express yourself in calligraphy art. 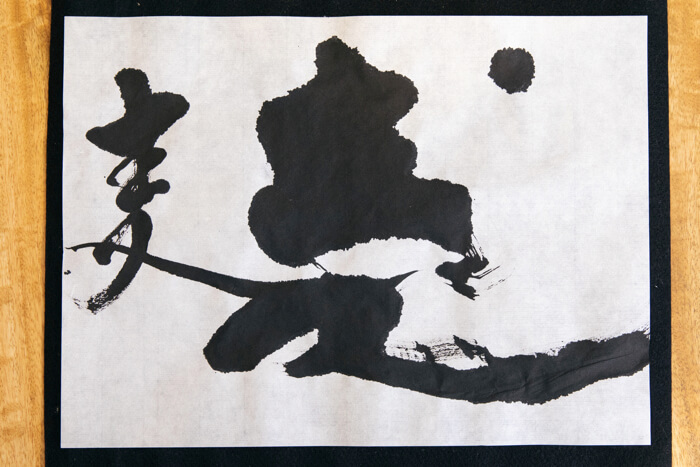 Also, hanshi paper used for calligraphy has a glossy surface. 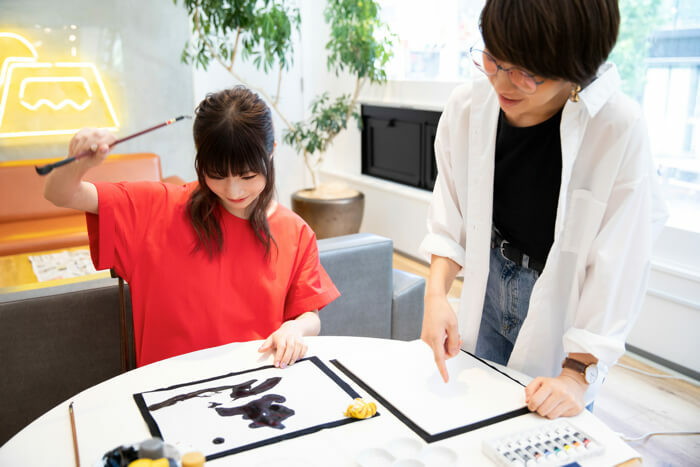 With calligraphy art you want to let the colours run and spread, so Ainyan is using the back of the paper. 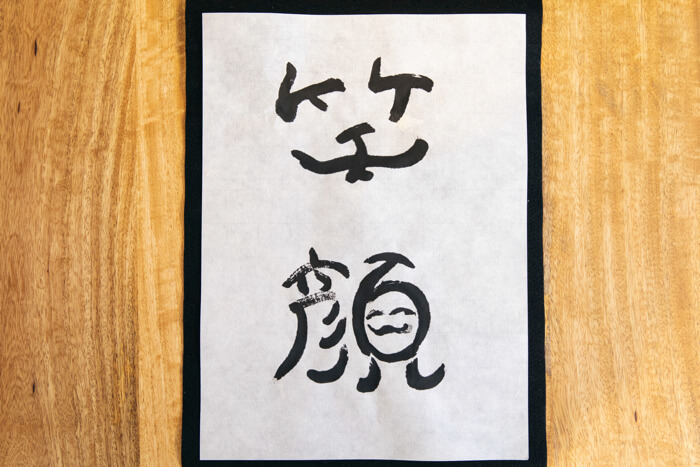 Ainyan begins by challenging herself to writing the kanji麦 (mugi) which means ‘barley,’ a fundamental ingredient used in beer which Ainyan loves. Don’t think about the art side of things straight away. Just write it normally first. This is Ainyan’s first attempt at writing out mugi. Next is to think about how to write it in a more running style. She could write it in a patchier way, drip ink over it, have parts sticking out and so on. Ainyan goes ahead and splotches lots of ink on. 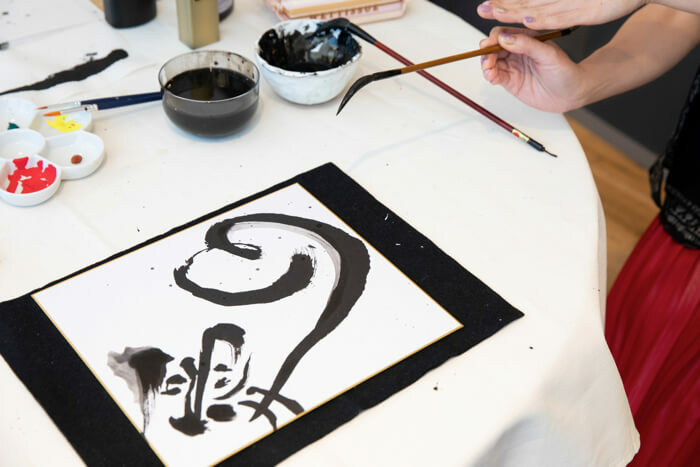 She dips plenty of ink onto her brush, so much so that it’s dripping off, and begins writing in a large and thick style from the first stroke. She continues writing like that until the end without topping up her brush with more ink. Her final stroke comes completely off the paper! 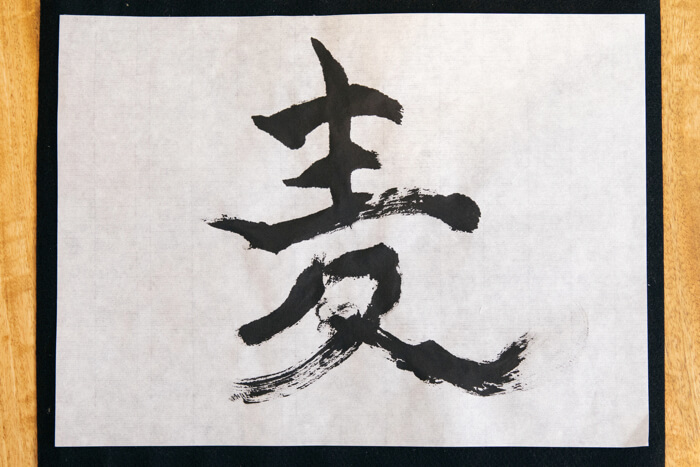 Ainyan was concerned that the top part of the kanji was too black and blotchy because of how much ink she used. “What should I do so that the middle part doesn’t become blotchy?” she asked. “If you lift the brush up vertically, like it’s floating, then you can draw thinly,” the teacher replied. Ainyan learned while the teacher lent her a hand. Her second attempt at writing mugi has fairly thick strokes. You can feel the vigour in this piece. Taking into consideration what the teacher said, Ainyan gave it another shot. 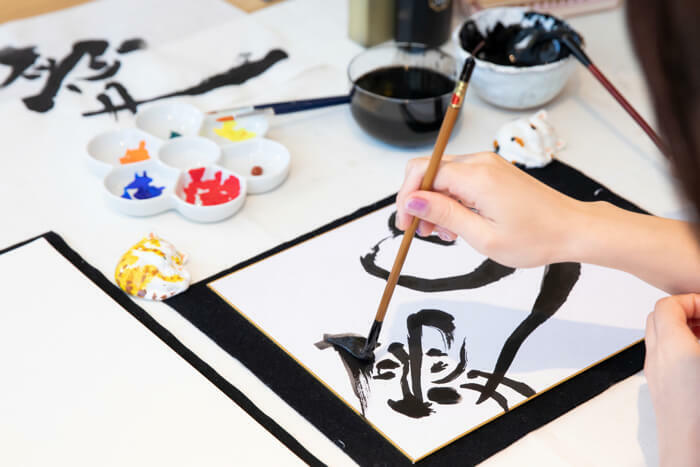 She dipped it into plenty of ink once more and began writing with strong strokes and keeping the brush upright to draw thin lines while adding variations. Compared to the first attempt, this version of mugi is slim and confident. “I want to hang it up in an izakaya!” said Ainyan laughing. 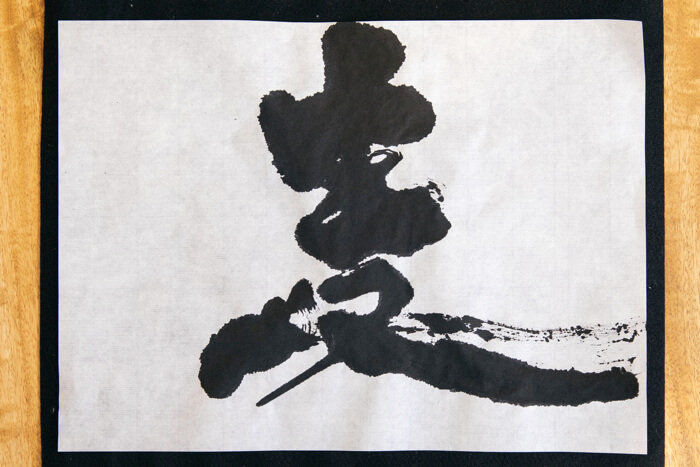 After having understood a bit about art penmanship, Ainyan moved onto another kanji. The one that came to mind was笑顔 (egao) meaning ‘smile.’ She starts out by drawing it in the way she likes. This is her first version of egao. The first kanji 笑 meaning ‘laugh’ is drawn like a face, while the 顔, meaning ‘face’ also has a face in the 頁 section of the kanji on the right. 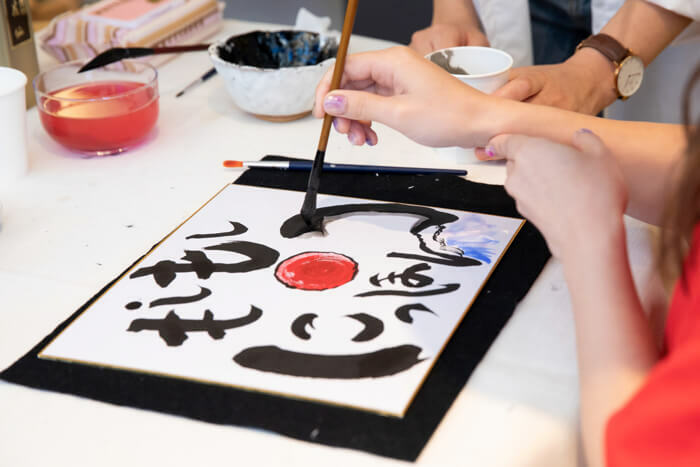 “If you know a kanji like this, then no matter how much you alter it you can still read it as ‘笑顔’ so it’s okay to change it as you please,” the teacher said. Next Ainyan thinks on how she can improve the piece. “The ‘笑’ kanji looks like a dog so I might try to make it look a bit more like a dog. The ‘顔’ kanji has a lot of legs and looks like an octopus so I’ll make it an octopus!” she said. 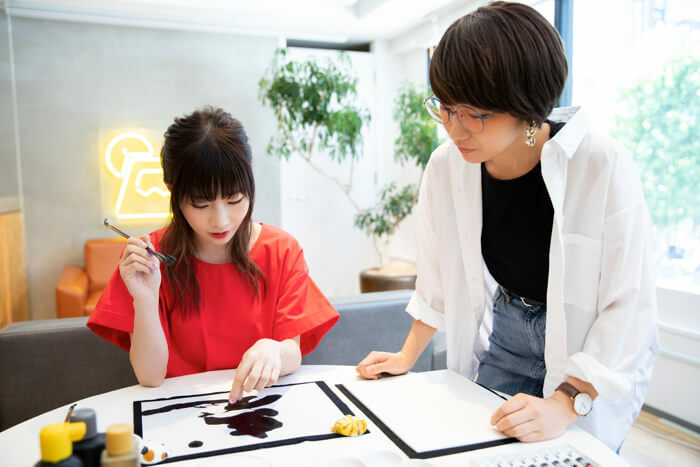 Ainyan begins making her kanji characters look like a dog and octopus while having the original to the side as reference. She made the strokes of the 笑 look like ears and fit in eyes and a nose to look like a dog. 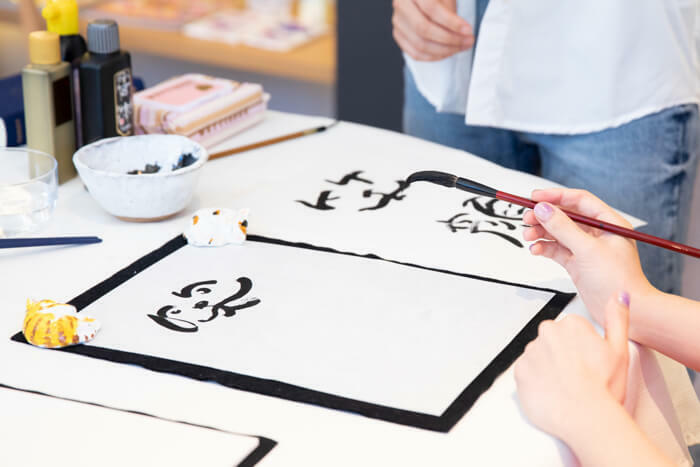 She also connected the 彦 part of 顔 to the 頁 part and made the face look more like an octopus face. Truly a work of calligraphy art! The next important step is to add colour. If you add too much water to your water colours they will fade when you add on the ink, so it’s important to layer the two by not using too much water. If it becomes patchy add just a little bit of water. Adding a border makes the white parts that are left look cute so Ainyan left part of the inside of the dog’s ear white. She used orange for the dog’s ear and red for the octopus’s legs. To top it all off, she painted a doggy paw print in a free space. Finally, Ainyan drew up a new and final copy on the coloured autograph paper by fixing up any small details and adding colour. Her first piece of calligraphy art is complete! “I’m really satisfied I got to do something I was wanting to do!” she said with a smile – a 笑顔. Ainyan looked over pieces the teacher had created and was especially interested in the ones with blotted ink. She decided to challenge herself to making such a piece. The kanji she decided on was 愛 (ai) meaning ‘love’ which is also part of Ainyan’s own name. Once again she readied plenty of ink and began with strong strokes. She drew the thin parts of the character while bringing out the details until she finished with a final strong stroke. She made the right part stroke of the 心 part of the kanji blurry. This effect is achieved by adding some water to the brush and pressing it onto the stroke you have already drawn that you want to make blurry. Her kanji is complete! The blurriness gives it a 3D effect. 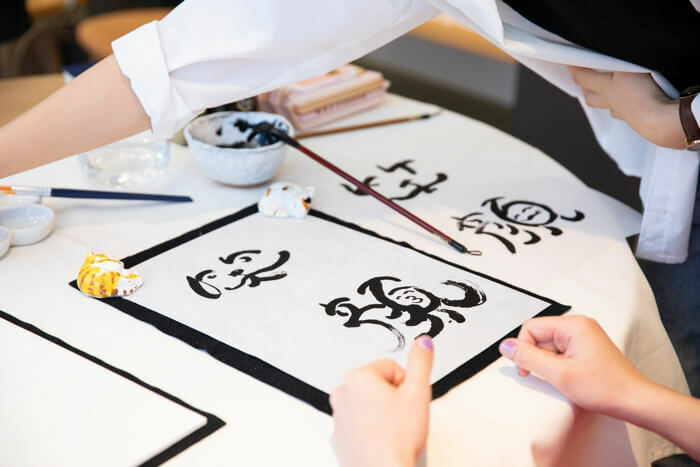 No painting tools were used and yet Ainyan was still able to create art from calligraphy. She made a final copy of this on coloured autograph card too. To make it even more arty Ainyan turned the final stroke into a love heart which she added water to for the blur effect. Ainyan wasn’t satisfied so she sprinkled ink around the heart for additional effect. 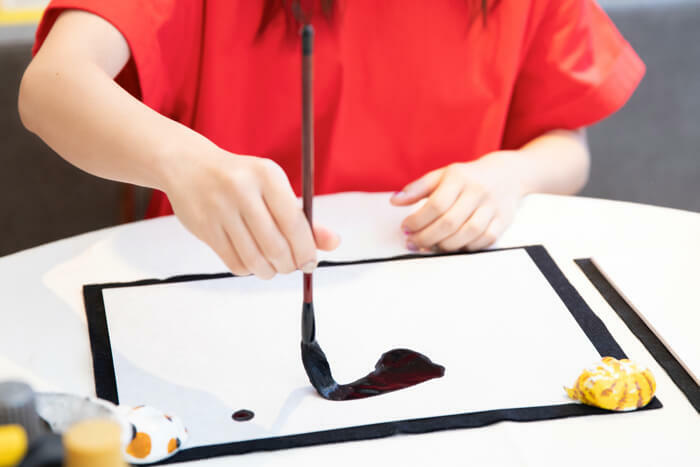 To do this, you hold the brush horizontally and hit the end of the brush to make the ink sprinkle down. After checking the balance was right, Ainyan signed her completed piece. What a vibrant and lively piece of calligraphy art! But Ainyan wasn’t done just yet. To commemorate this month’s feature, she drew one for MOSHI MOSHI NIPPON (もしもしにっぽん)! She made the circle part of ぽ (po) a red sun which symbolizes the Japanese flag and made the ん (n) look like Mount Fuji. We are pinning this up at the MOSHI MOSHI BOX Harajuku Tourist Information Center, so be sure to look for it if ever you stop by to see us in Harajuku. Ainyan wrote so many! Here are her comments on what looked to be a hugely satisfying occasion. In the next article, we will be joined by SILENT SIREN vocalist Suu. Look forward to seeing where she goes and what she gets up to! 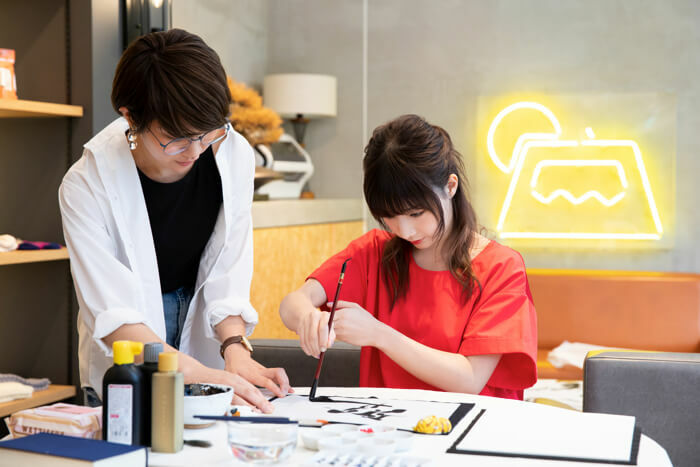 Yuki works as a calligraphy instructor and is also active in producing works for art events, commissions for projects and elsewhere. Next » SILENT SIREN Debut New Article Series on MOSHI MOSHI NIPPON–Get to Know Them Off Stage! SILENT SIREN Debut New Article Series on MOSHI MOSHI NIPPON–Get to Know Them Off Stage!